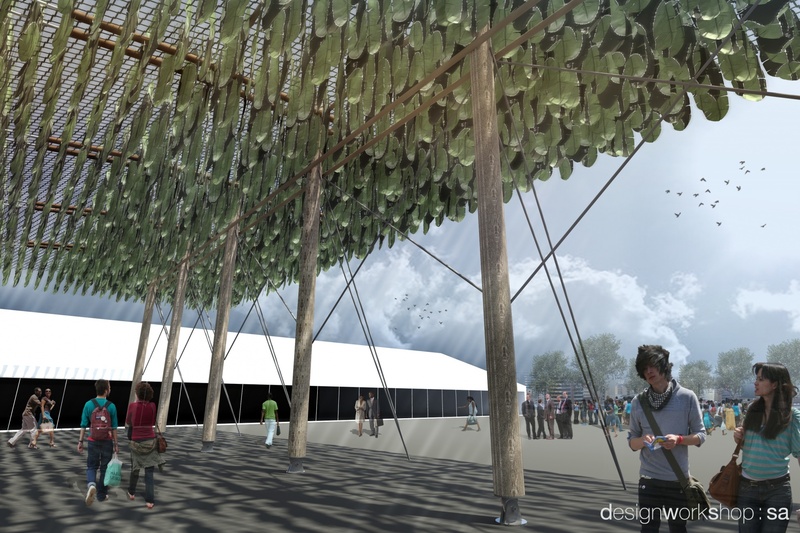 The look of the South African Climate Change Response Expo running alongside COP17 in Durban was conceptualised by designworkshop : sa. On 28 November 2011 the 17th Conference of the Parties (COP17) kicks off in Durban, marking the first time this meeting about climate change takes place on the African continent. The Climate Change Response Expo runs alongside the main event, as a public platform to understand and debate issues of climate change. It is in this space that performances, discussions and exhibitions will be enjoyed by the public, free of charge. From the outset it was important to the organisers that this public space captures the essence of the matter at hand, making it accessible and interesting, while also embodying the climatic conditions and cultural nuances of the location, Durban. 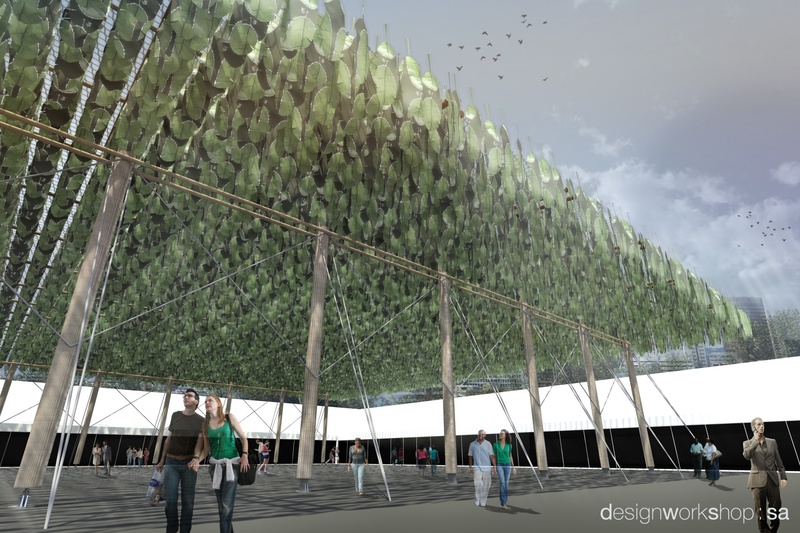 Durban-based architects designworkshop : sa, were approached to conceptualise the look and feel of South African Climate Change Response Expo area at COP17. designworkshop : sa devised three distinct elements for the space, namely the Africa Green Square, the Green Temple and the Green Route. The green thread running through these structural aspects is the use of sustainable materials, the incorporation of natural and cultural elements associated with Durban and the greater KwaZulu-Natal and the response to the typical climatic conditions of Durban at this time of the year. Africa Green Square refers to the main 80 x 80 metre outdoor exhibition space enclosed by the COP17 South African Climate Change Response Expo marquees.This space had been divided into four conceptual quadrants in which what designworkshop : sa have coined the “Big Five + One” are represented. “Big Five” is the term used to refer to the natural resources water, food, energy, oxygen and the ecology. The “+ One” refers to socio-economic activity carried out by human beings as they use the natural resources. Socio-economic activity is arguably the most important element in the climate change story, as it is believed to be the primary cause of the problem, designworkshop : sa’s Andrew Makin explains. The black tarmac ground of the Africa Green Square was another element that benefitted from an aesthetic transformation, rooted in sustainability. A Durban-based artist was commissioned to paint a pattern with a strong Indian cultural component on the ground surface, using organic paint to create a super-sized mehndi inspired graphic. The Indian pattern refers to the fact that Durban is home to the largest Indian population outside of India. Using the mehndi inspired tradition to add a decorative cultural element to the ground also worked to make almost 30% of the area lighter and thus cooler, and ideal for a hot Durban summer. “We also wanted Africa Green Square to capture the character of this specific COP event, the 17th one, held in Durban, South Africa,” says Makin. To capture a sense of the KwaZulu-Natal landscape designworkshop : sa chose to utilise Gum trees (Eucalyptus), together with banana leaves. The Gum trees are placed 5 meters from each other, in two 45 meter long parallel rows each 30 meters apart. Ropes are then strung across the poles, creating a structure that can be likened to a spider’s web. The ropes are made of the natural Manila fibre, which is a renewable natural resource. A cargo net is then stretched across the entire surface of the Green Temple. Wild banana leaves (Strelitzia Nicolai) are then hung on a 200mm grid from the cargo net by their stems to provide shading. For those in the know the choice of Gum trees may seem controversial but Makin explains the sustainable motivation for this indigenous trees: Gum trees are grown commercially in the northern parts of KwaZulu-Natal to make paper. The machinery used in the harvesting process struggles to reach trees growing on steeper slopes. Many of these trees therefore grow too large for for harvesting and for the pulping process and are therefore left to unnecessarily consume water in the forests. It was specifically these trees that were used in the construction of the great Green Temple. Wild bananas trees grow abundantly in KwaZulu-Natal. The leaves are about a metre and a half in length and 500mm in width and, as Makin describes, “glow exquisite translucent green in the sunlight, an image that is emblematic of this sub tropical part of South Africa”. Some 20 000 banana leaves were used in the creation of the Green Temple. The banana leaves that are used for shading also serve as a metaphor for what happens in the natural environment. At first the leaves are a deep luscious green, slowly drying to gnarly brown, and finally disintegrating. Makin says that this transformation is inherent to the natural ecology where the ‘death’ of one thing means the life of something else. Human beings are the only species on the planet whose waste is not the food of something else. He remarks that this is indicative of the extent to which we have removed and alienated ourselves from the very system that fundamentally sustains us. 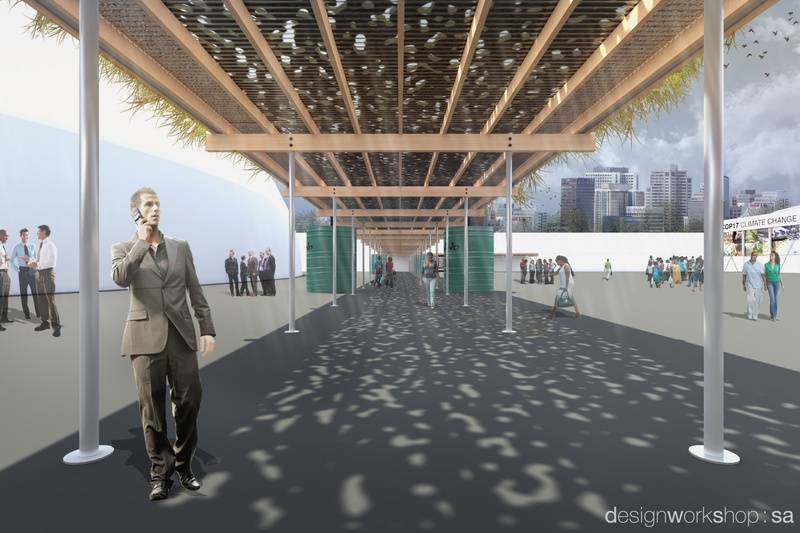 The Green Route is a weather-protected walkway comprising a simple timber structure, five metes wide, that wraps around the perimeter of the Africa Green Square. The Green Route is covered with a clear polycarbonate roof structure onto which indigenous flora is planted. 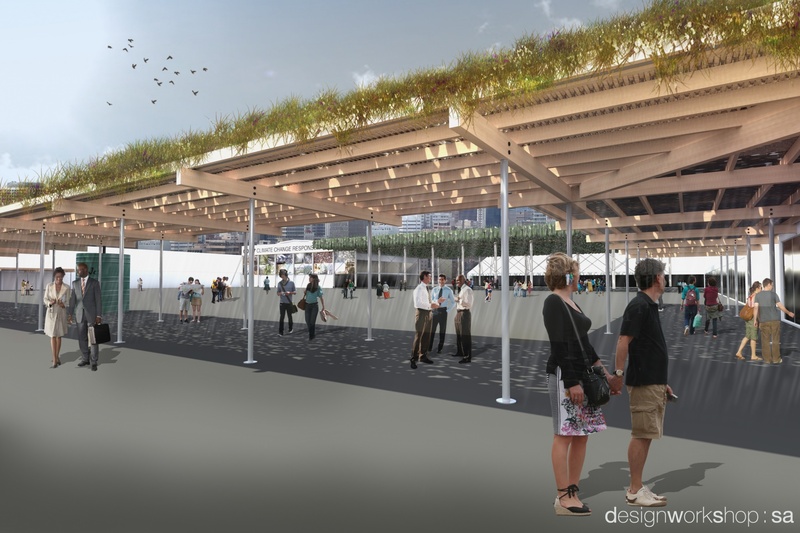 A reusable clear material was specifically chosen to so that when visitors using the walkway look up they will be able to clearly see the substrate in which vegetation grows. The center section of the roof will be filled with bark chip, another natural material through which light is delicately filtered, making reference to the quality of light under the shading fever trees of northern KZN. The South Afrcan Climate Change Response Expo pavilion at COP17 in Durban aims for a poetic though “back-to-basics” look and feel. “It’s essentially about resourcefulness, converting the ordinary to the extraordinary, the power of simplicity and the immense opportunity of scarcity rather than indulgence. About generating wonderfully emotive experiences by dong very little; using very little and letting the power and wonder of our abundant light generate the experience, and the gentle coastal breezes to do the work of cooling,” Makin concludes.